Ann Ogbomo is listed as taking part in a conference being run by the Shakespeare Centre in Stratford on Saturday 11 – Sunday 12th September 2010 called “WRITING ABOUT WOMEN IN SHAKESPEARIAN PERFORMANCE”. Ann, of course played Lady Percy before moving on to various fiends and attendants, the Countess Auvergne and ending the cycle as Lady Grey and Queen Elizabeth. Also scheduled to be taking part is Penny Downie, an unforgettable, if not definitive, Gertrude in David Tennant’s Hamlet. Details and registration can be found by emailing education1@shakespeare.org.uk or calling 01789 207131.
when she played Queen Margaret. It was in a production of a collection of the history plays. I think it was called “This England, the histories”. part a strong animated character still forceful and womanly. 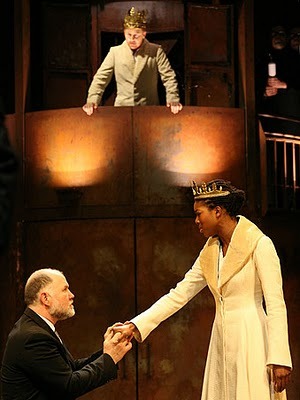 I saw that at the RSC on a saturday morning, afternoon and evening including richard III. A wonderful day, not to be found anywhere else. I remember Pennie Downie a few years ago playing both mother and daughter in Winters Tale and also Portia in Merchant. To me her Portia was the definitive performance.